Arrested? Charged with a Crime? Drive by shootings, assault, murder, & robbery are the types of cases we specialize in. We work hard to get your charges dropped or reduced. No case is ever a "lost cause". Over 25 years of Criminal Law Experience; we have the right skills to fight for you! If you need a top notch Criminal Defense Attorney and team, look no farther. Our system of justice guarantees that we are innocent until proven guilty in a court of law. Just because you have been arrested or accused of a crime does not mean you should give up. You need to protect your rights by hiring an attorney who KNOWS criminal law. At the Law Offices of John K. Jackson, whether you are looking at felony or misdemeanor charges, you may rest assured that you have an experienced aggressive attorney on YOUR side. I practice in Visalia, Porterville, Hanford, Tulare, Fresno and throughout the state. Being arrested or accused of a crime can be a life altering event. The consequences of choosing the wrong attorney can be devastating and irreversible. The bottom line is that our firm's experience, attitude and willingness to fight for you can not be equaled. Not only does our firm provide the best representation possible, we have access to a team of experts and investigators that work for you on your case. 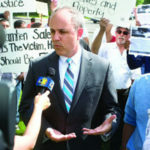 It is imperative you choose an attorney who has a strategy and the ability to carry it out. Attorney John K. Jackson is a trial tested and proven top tier Criminal Defense Attorney and has the experience that can not be matched. Attorney Jackson has even been used by other attorneys on criminal cases to be an expert in gang related crimes. Our firm works aggressively on cases as simple as disturbing the peace through more complex cases such as murder and homicide cases. We promise to treat every client like a human being and not like a case number.